Vertu, the British manufacturer of luxury, hand-made phones has again shocked us with their launch. Christened as Vertu Signature Cobra, this is Vertu’s newest launched mobile phones, which costs Rs 2.3 crore or roughly $360,000 a piece. If you are wondering why should buy it, let us inform you that this is a feature phone, and has limited features pertaining to apps and the Internet. According to GizChina website report, the Signature Cobra is made up of 388 Parts and all of them are assembled in the UK that so far has made only 8 units of the feature phone. It is up for sale on Chinese e-commerce portal JD.com and customers can pre-book the phone by paying $145. The company will deliver the device to customers via helicopter when the entire payment is made. Vertu Signature Touch comes with a 21MP rear camera along with Dual-tone LED flash, as well as a 2.1MP front selfie. For an enhanced sound experience, the device incorporates a Digital front –facing speakers, and running Android 5.1 Lollipop OS. This device offers 4G LTE, 3G, Wi-Fi, Bluetooth, GPS and NFC as major connectivity options. This device runs on 3160mAh battery. Last year in January, Vertu launched its Signature Touch smartphone in association with Bentley. It has a 5.2-inch Full HD display with 1080×1920 pixel resolution and is powered by an octa-core Qualcomm Snapdragon 810 SoC, paired with 4GB of RAM. There’s 64GB of internal storage, with support for microSD cards of up to 2TB in size. Vertu’s phones, in the past, have been described as ‘tasteless trash’ by leading magazines, and have been criticized for creating something which has no importance, but very high cost. As if, the makers of Vertu (whom Nokia acquired in between, and then sold) are trying to create a status symbol, out of mobile phones. However, in the case of Cobra based feature phone, the keyword here is the snake, which is regarded as a very important mythological figure for Chinese. And most probably this is the reason it has been listed only in China as of now. 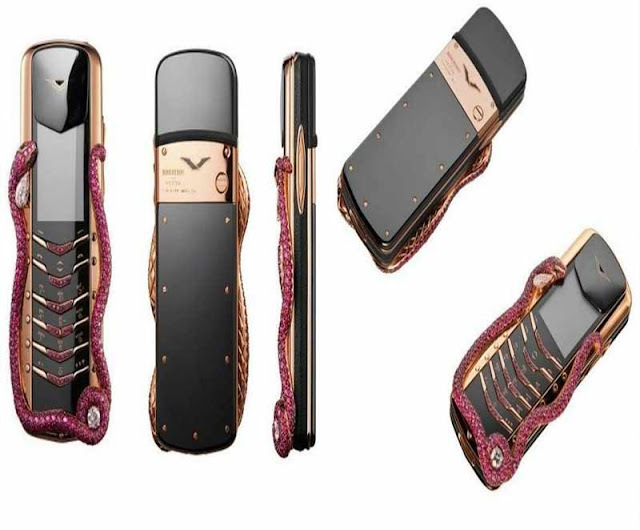 Maybe Vertu understood that there is a market for rich, rubies embedded feature phone with an emerald snake’s eye in China, and that is why they created it in the first place. But for others, this holds much less significance. Why do you think Vertu launched such expensive mobile phone? Do let us know by commenting right here.